In 2018 we successfully completed the Department of Industry, Innovation and Science’s Business Research and Innovation Initiative. In doing so, we set out to understand what the government really needed when it came to engagement. The results, which ultimately became our software platform, Scaffle, were at once both surprising and obvious. Policy makers are mandated to consult on almost all new or revised policy that will impact business or public communities. However, it falls to the policy team to design and undertake the engagement on all but the most visible or contentious projects. We had expected “engagement managers” to exist across all Departments. But what we found was a handful of siloed experts working on high profile projects while most teams just scrambled around for “what [they] did last time”. What does a lack of engagement expertise mean for practice? Once we understood how under-resourced for engagement the average policy or service design team was, we saw the real challenge. A more user-friendly or collaborative app isn’t going to improve engagement if the people driving it don’t know how to write a good question or make sure it’s asked at the right time. In essence, this creates a negative feedback loop. New and eager policy-makers, excited to engage, make the same mistakes all of us have when we started out. The most common is trying to collaborate too late; which results in anything from frustration to complete outrage and disaster. Once bitten, twice shy, the team is likely to seek less risky engagement methods the next time. From the inside its not always easy to diagnose what went wrong. It can seem like the topic or the technique caused the upset. But experienced engagers know that it is possible to navigate the even the most sensitive topics if planned and managed carefully. Instead of new channels, apps or activities, what is really needed is better support to plan and deliver engagement. They need easy access to engagement information that helps them learn faster and plan better. Often, dedicated colleagues have already done a lot of great work to identify how to do better engagement in your unique context. This might be in the form of a strategy document or more specific recommendations about how to run certain activities. Unfortunately, in large organisations not everyone is aware of these resources, and they may be too high level to be actionable. Scaffle was created to help. When you create a plan it will connect you to key process information and tips from your internal engagement strategy. Likewise, it makes you aware of any other policies, such as ethics assessments, or other approvals you might need. It doesn’t replace the need for you to research and think, but it can take some of the headache out. 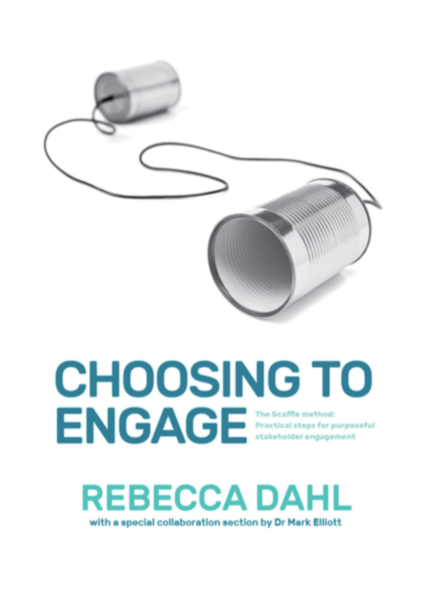 If you like to get into the details, our book, Choosing to Engage, documents engagement planning. It contains a step-by-step method, a reference guide of engagement activities and a whole section dedicated to those tricky collaborative style engagement processes. If you would like a copy of the book, use the code “CFBLOG” for a 50% discount*. Scaffle’s mission is to improve the dialogue and impact of the public on the policies and services that affect them. And in doing so, we hope to do our part to rebuild trust in the government. Please get in touch to schedule a demo of Scaffle if you would like to know more.